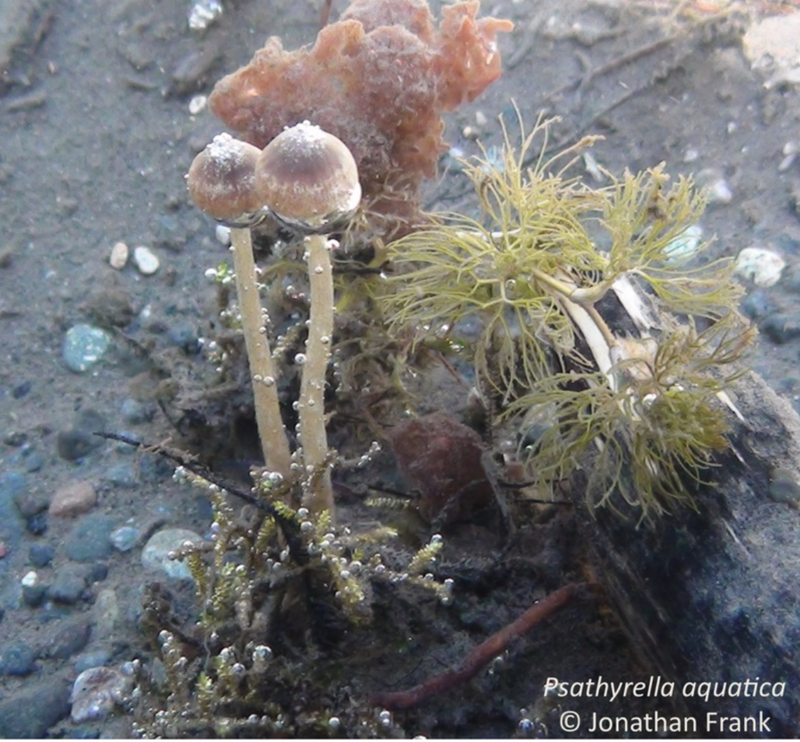 The aquatic gilled mushroom; Psathyrella aquatica. Photo by Jonathan Frank. Last week, I was fortunate to make my pilgrimage to Yosemite National Park. In the midst of a government shutdown, I feared that the roads would be closed off and my longing to see this majestic, Rhode Island sized piece of land would not be fulfilled. I was incredibly lucky to have just made it, with the park officially closing the main entrances last night. The sights I saw humbled me to my knees. The environment seemed to contain an immeasurable, captivating power over me, and Yosemite Valley felt like holy ground. And I only got a taste! In the winter, the upper elevation roads are closed so much of the park is inaccessible. With Trump’s wall tantrum, many of the hiking trails from the valley floor were too inaccessible without proper maintenance. I did a ton of homework prior to my travels to find a proper trail, but most were unavailable. My first day there, I defeatedly trudged in one of the only open stores in the valley, a book store stacked high with John Muir memoirs and naturalist guides of the area. I started to inquire about possible hikes with a worker there, and he recommended a trail. Seconds later, an assured voice filled the bookstore and explained that the recommended trail was dangerous and off limits to the public, especially solo hikers. I look up to see a woman in her late 40s with the prowess only a Yosemite Park Ranger would have. I gravitated to her, and she told me the two possible trails I could set off on the following day. Her knowledge along with her love of the park was immense and we talked for 15 minutes even after the bookstore closed. Feeling more confident, I drove 30 minutes to the Yosemite Bug hostel, dove in my tent, and excitedly awaited my hike the next morning. A picture I took of Yosemite Falls the day before I hiked to the top. Check out how small the cars are at the base of this mammoth piece of glacial carved granite. Driving into the valley at 9:00am, I felt great. There was a quality of stillness that made me believe I was going to have one of those days that you think about for the rest of your life. Driving into the valley, I stopped to take a closer view of the Merced River. The scenes were so picturesque. These giant granite cliff walls climb nearly a mile from the valley floor overhanging the river. This was an interesting experience for me, because I’m usually looking for fine details in nature, finding fungi and learning about their intricate interactions. Here, my psyche shifted to a broader landscape view looking at the mammoth geologic formations. But along the side of the river, I zoomed in and looked at the fine details. I found a ladybug overwintering on a patch of grass. I heard the tumbling of the river. I saw through to the bottom of the clear pristine glacier fed river and thought about a fantastic species of fungus found one state north in Oregon. Pristine glacier fed waters of the Merced River. In 2005, a little brown mushroom was found under the surface of the pristine Rogue River in southern Oregon. This was in no way a fluke, with dozens of specimens being collected and analyzed each year after its initial discovery. Using new genomic technologies, the DNA of these specimens were analyzed, and it was confirmed in 2010 that what we have is a new described species of fungus. It was featured on the front cover of the 2010 January edition of Mycologia, and has captivated my interest since I learned about its existence. Not much is known about its ecology, other than the fact that it breaks down dead organic plant matter. It is quite peculiar, because transitional forms along the lines of its evolutionary history shouldn’t have succeeded. The aquatic gilled mushroom; Psathyrella aquatica. Some specimens that fruit directly from the river bed have really elongated stipes that extend deep into the river silt, to anchor them in place. This riparian adaptation makes perfect sense, with their only known habitat being a relatively fast-moving river. What’s really most peculiar is its spore discharge. This is the only gilled mushroom we know of that fruits underwater, with the rest of the gilled mushrooms releasing their spores into the air. Gilled mushrooms only release their potential offspring when tiny water droplets form on their microscopic spores. How would this even function underwater? This species is on my fungal bucket list, and when I do find one, I can be sure to see an air bubble underneath its cap. This air bubble is key to its success, since without it, it couldn’t eject its own spores. Like us animals, fungi need to breathe too. This is another reason why only two populations have been found of this fungus. The cold, fast flowing Rogue River is notoriously oxygen rich. Not many rivers have this much dissolved oxygen that could support underwater gilled fungi. So, we know that the species can release its spores, and that there’s enough oxygen dissolved to allow the species to carry out respiration. But then what? These bubbles filled with spores then float to the surface and flow to the sea. Cool. A ginormous piece of the puzzle is missing, but the original authors who described the species have witnessed caddisfly larvae grazing on these underwater mushrooms multiple times over. They hypothesized that these larvae may unknowingly transport spores into nearby river sediment where the spores can germinate and begin breaking down organic matter. Look at those air bubbles! Photo by Jonathan Frank. Darlene Southworth, one of the authors of the paper describing the species, wants your help looking for this mushroom that is probably confined to the West Coast. It fruits in late summer and Darlene has an inkling that the species range extends into the cold, glacier fed streams and rivers within the Sierra Nevada. The pristine oxygen rich Merced River is a great place to look, as it shares many qualities with the Rogue River. In the future, when Trump has been dumped and OUR National Parks re-open, check out Yosemite Valley. If you too are a mycophile and find yourself there in the late summer, survey the Merced river bed for this awesome little mushroom. If Yosemite isn’t mystical enough for you, there are still new species to find.